This year is the first year that the National September 11 Memorial was open to the public on the day of the anniversary of the attacks. 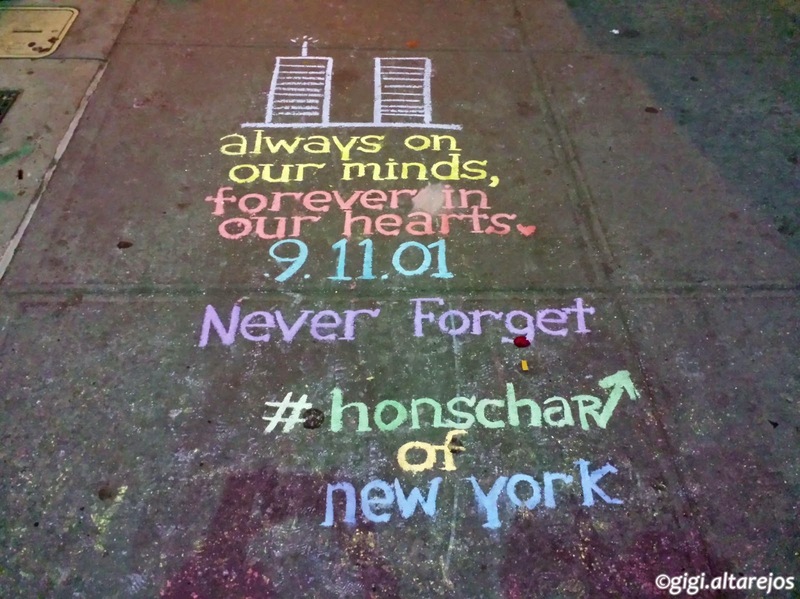 For the past 12 years, only the families of the victims and the first responders were allowed in the site on September 11. This year also marks the year that the public can freely go to the memorial with reservations no longer required. I wanted to experience being in the memorial during the anniversary date so after office hours on September 11, I went to lower Manhattan. 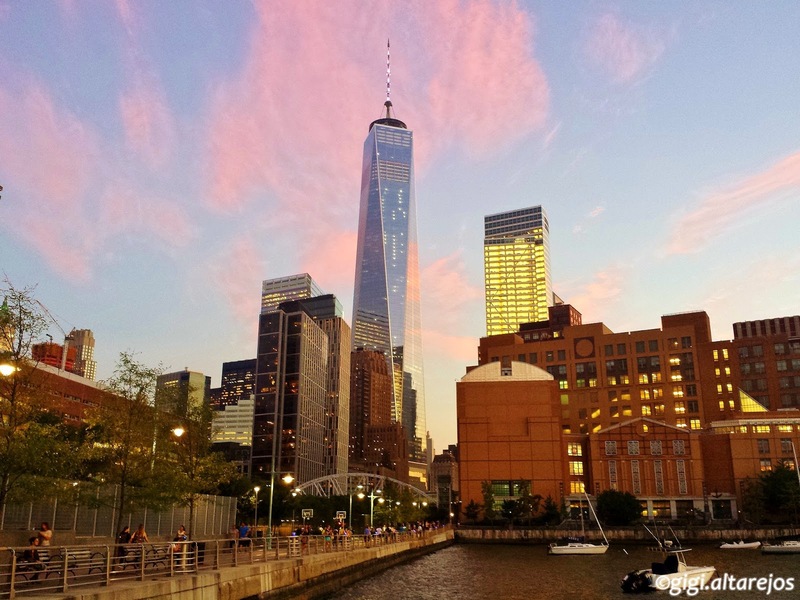 I dropped by Hudson River Park first, there were pink clouds near One World Trade Center as the sun started to set. As I was making my way to the memorial, I saw the Tribute in Light start to shine. 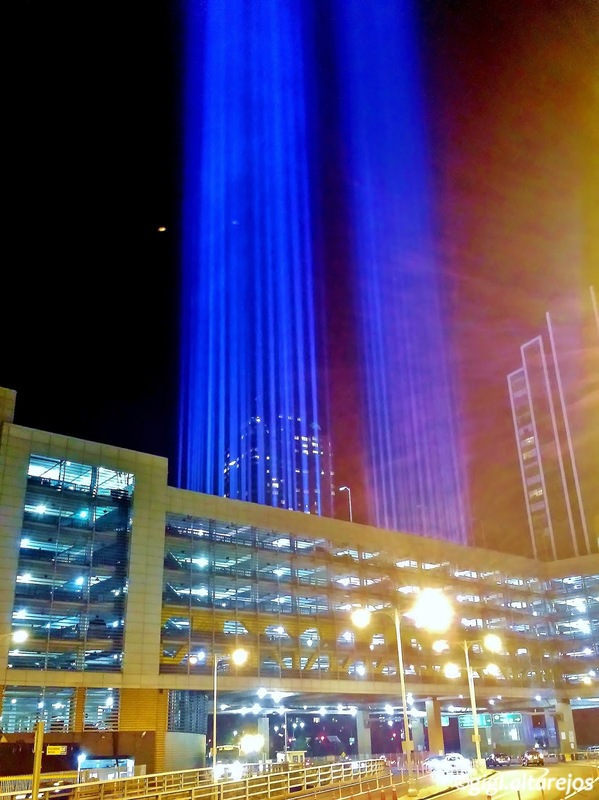 This art installation consists of 88 searchlights placed next to the site of the World Trade Center to create two vertical columns of light in remembrance of the attacks, and has been repeated every September 11 of each year since 2002. I took the circuitous route, walking towards where the Tribute in Light was before going inside the memorial. 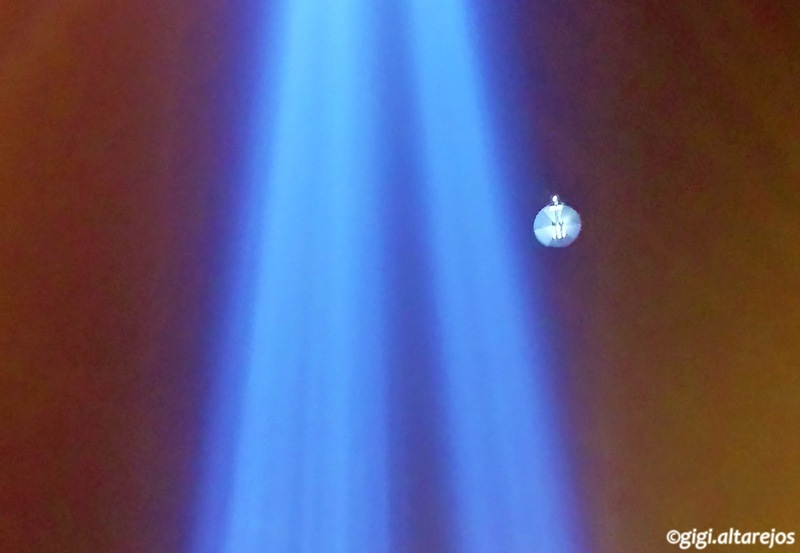 The searchlights were installed on the roof of an MTA property near the World Trade Center site. The dot on this photo below is a helicopter, one of the many flying near the lights that night. 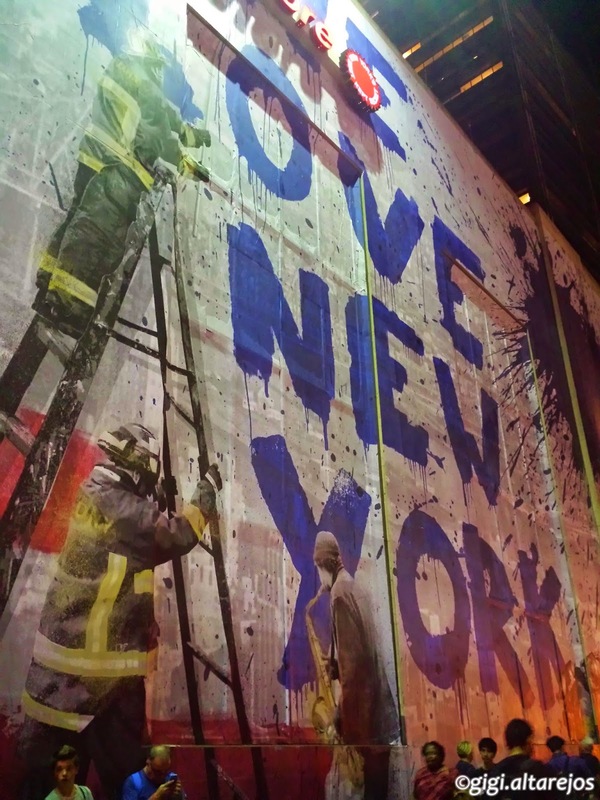 On my way back towards the memorial, I saw a new mural by Mr. Brainwash right across the World Trade Center site, a tribute to the victims of 9/11, featuring the messages "We Love New York" and "Forever." The mural was so huge it wouldn't fit it in my camera screen. Here are a couple of shots. 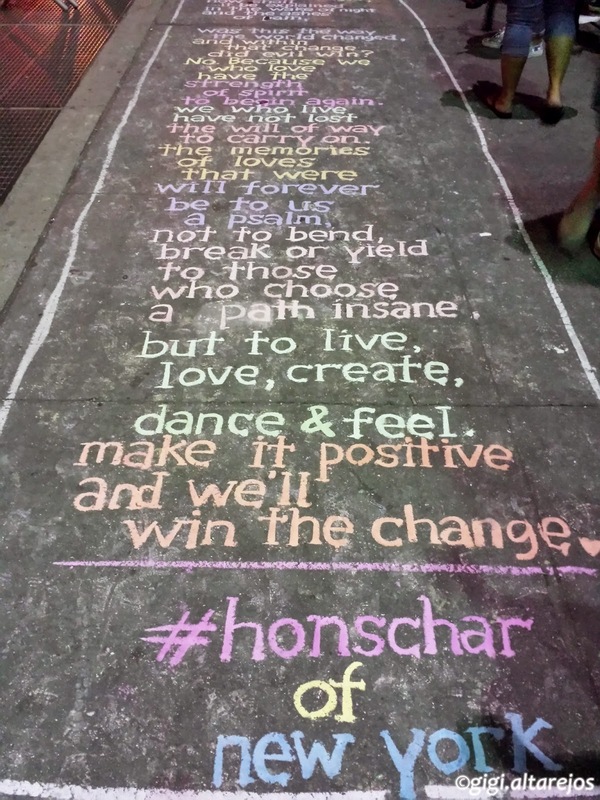 Street artist Honschar whose medium is chalk also penned a 9/11 tribute on the sidewalk near Mr. Brainwash's mural. If you're interested to see or read the whole poem, check my Flickr album for some zoomed-in shots. Adjacent to the above poem was this simple but meaningful tribute. 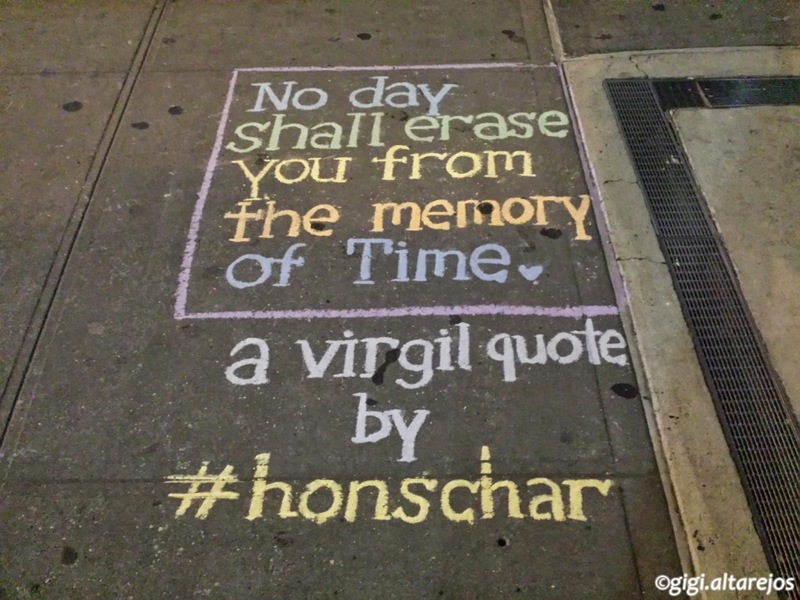 And of course, there's Virgil's quote, same quote is on display as an art installation inside the National 9/11 Museum. The panels surrounding the pools with the names of the victims of the attacks were filled with flowers, flags, badges, and sometimes pictures of the victims. Right across the North Pool is the National September 11 Museum. The tridents inside the museum were illuminated and shine across the memorial pool that night. 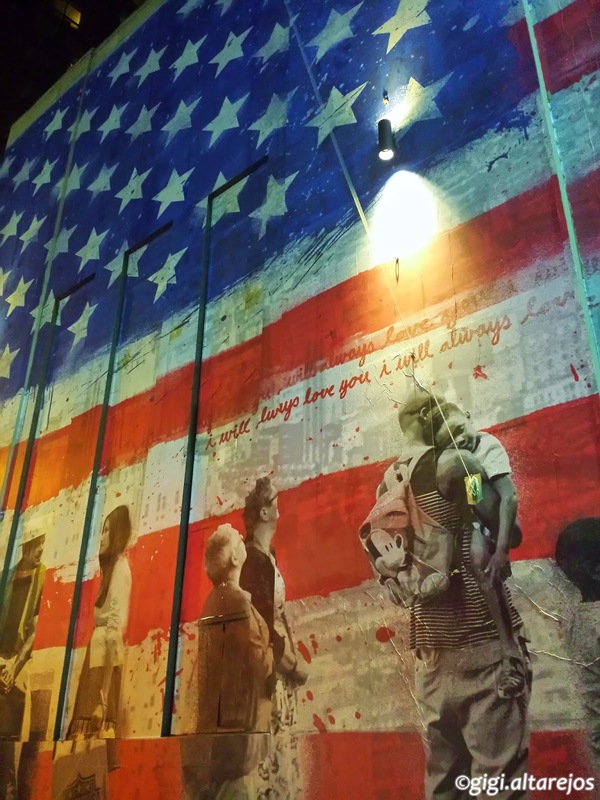 On a visit to the memorial a few days before the September 11 anniversary, I snapped a photo of the museum with the American flag reflected on one of the tridents. From the memorial pools, you can see the Tribute in Light at the distance. This was from the South Pool ..
And from the North Pool .. Some even have flowers in patriotic colors of red, white and blue. Four World Trade Center rises at the back of the Memorial Museum and it was great to see the two together with the Tribute in Light that night. And this was what I saw looking up at the sky .. 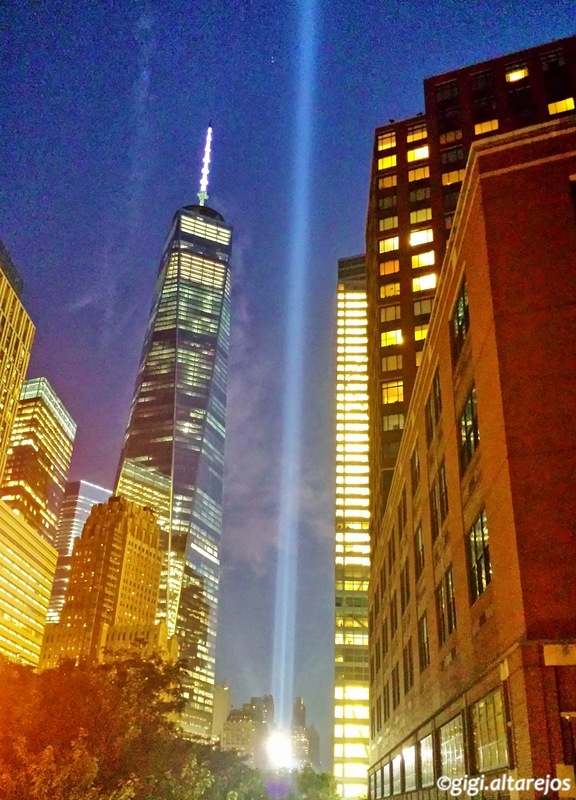 Earlier while I was on the street near the Honschar tribute, I had a different angle of the Tribute in Light and Four World Trade Center. 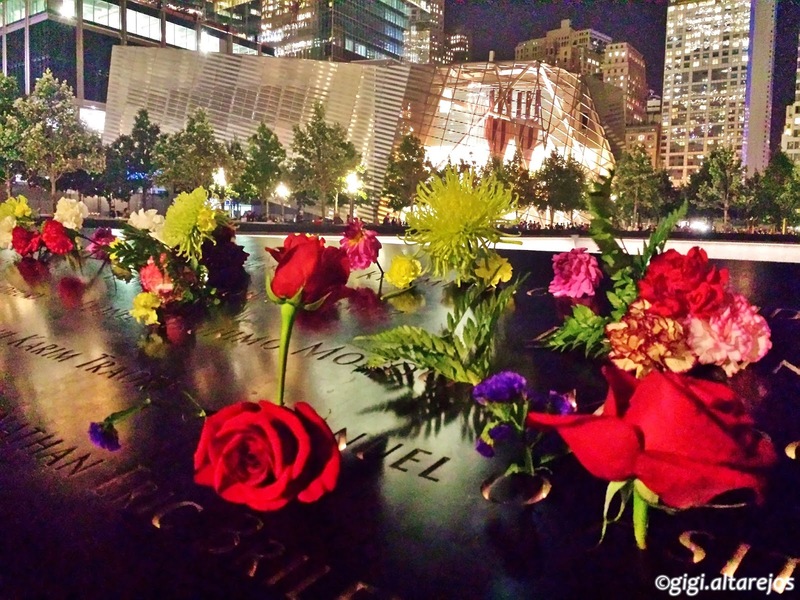 It was a beautiful evening and the memorial was overflowing with people who wanted to remember the day and #Honor911. Just a few days before when I was there for a night visit, the memorial was peaceful as there weren't too many people there at nearly closing time. 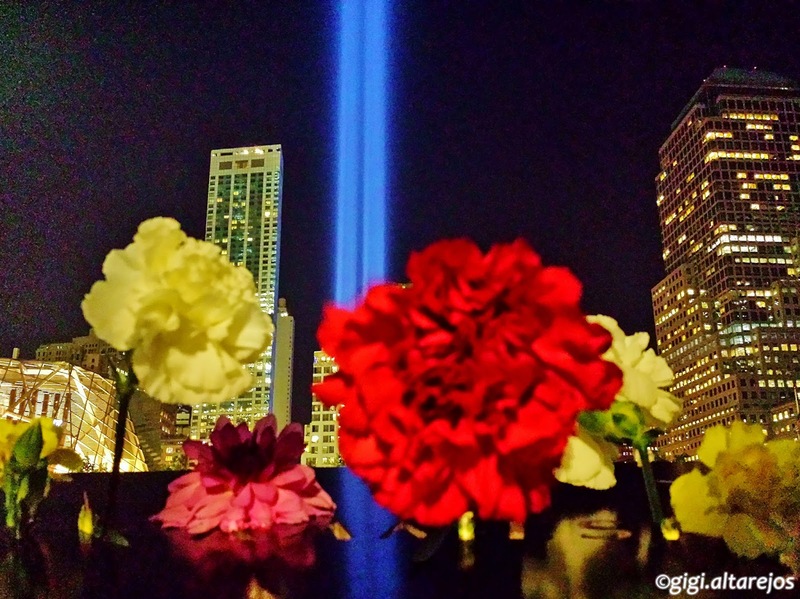 To see the Tribute in Light from the memorial was one memorable experience, and it was moving to see the offerings and tributes honoring the memory of the day and the victims. Over at the FDNY Memorial Wall right across the 9/11 memorial were more tributes to the 343 firefighters who died as heroes that day. 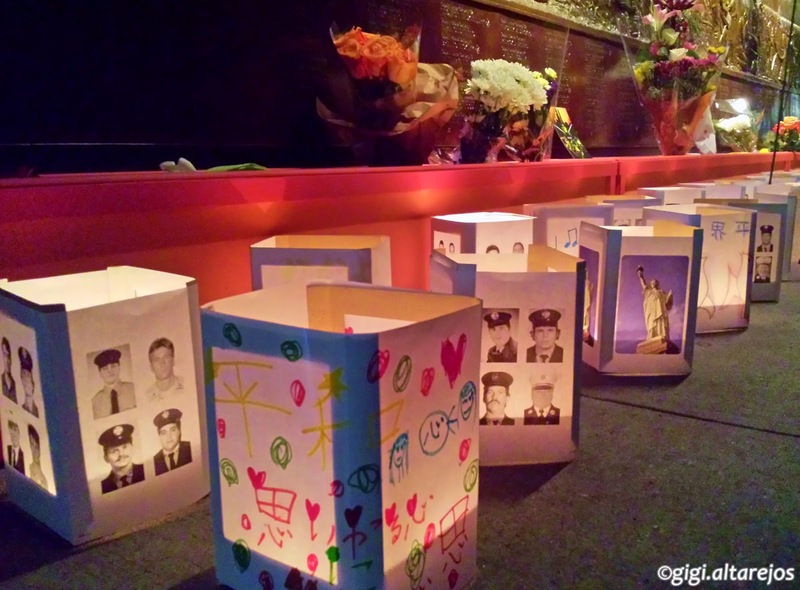 I love these paper lanterns with pictures of the victims and some with drawings from kids. 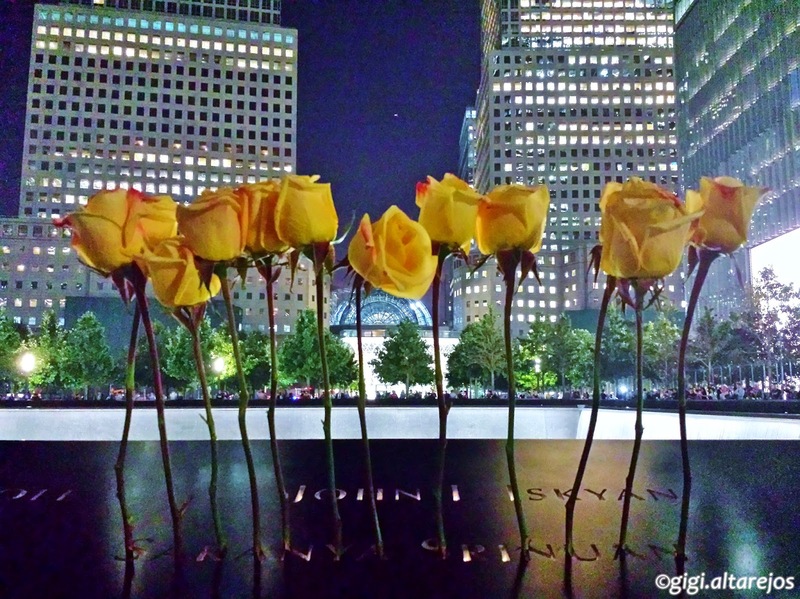 If you stand near one of the edges of the memorial, you can see One World Trade Center reflected on Four World Trade Center, and remember the Twin Towers again. And a quote by Edith Wharton comes to mind .. There are two ways of spreading the light; to be the candle or the mirror that reflects it. 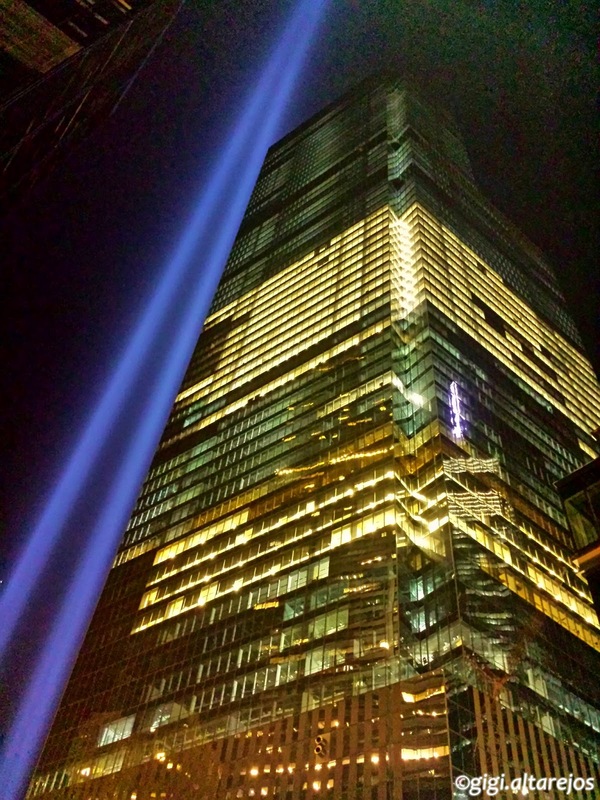 May we all spread the light and #neverforget to #honor911.